This book was a birthday present from a good friend who had also given me The Name of the Wind by Patrick Rothfuss for my birthday the year before. So I basically knew I was going to love this book. And I did. This is one of the books where I just sat on the couch reading for an entire day because I had that ‘I need to know what happens next right now’ feeling. God it feels good when you read that kind of book for the first time. This book by Scott Lynch is about Locke Lamora, a con-artist mastermind who learned the trade from Chains, a priest who’s more than he seems to be. Locke is damn cunning, bluffing and double-bluffing his way to thousands of crowns. He has his gang called the ‘Gentlemen Bastards’ to help him; Jean, who is deadly with hatchets; Calo and Galdo, the quick-fingered twins; and bug, their eager to learn apprentice. Of course his luck and wealth can’t last, and a man called the Gray King has it in for him, and soon Locke has to lie his way out of several deadly tight corners. The beginning of the book was a bit slow: Lies of Locke Lamora uses an interesting classification system of parts, chapters, interludes and subchapters to jump between young Locke and adult Locke, and this confused me at first until I got the hang of it, although that might have just been me and my damn brain being glitchy when I started. But I got sucked into the story pretty soon. One of the traits, or I guess I should say qualities of this book is that Scott Lynch can be brutal with his characters; he can easily be compared to George Martin on his best day. He’s not shy about cursing or murdering in horribly graphic ways. Where it differs from Martin’s writing style is that it is in no way historical fantasy. The element of fantasy is way more present in this novel: the very foundations of the setting are magical (or alchemical, if you want to be specific). Yet Lies of Locke Lamora is no run-of-the-mill fantasy: there is no coming-of-age factor; no quest. Just survival of the best thief. If there is a learning process for the main character, I haven’t found it, and if it’s a good ending… well, that might be what part two and three are for, and I will let you know as soon as I possibly can. An example on how good Scott Lynch is. 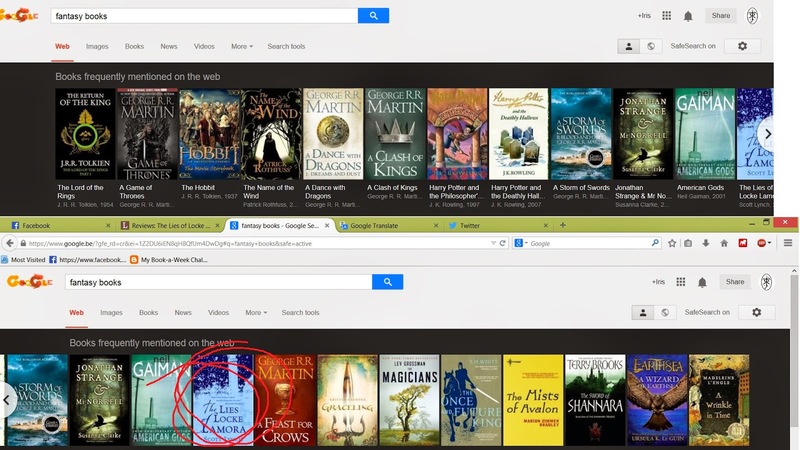 When I type ‘fantasy books’ in google, I see this. It’s the twelfth most mentioned fantasy book on the internet, people. Pretty sure that says something.